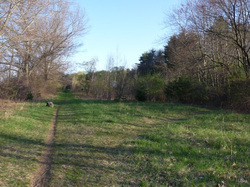 The Playscape at Ripley is in Concord's East Quarter, a rich historic natural area between Lexington and Bedford Roads (view a schematic map of the area, including the Playscape's location). While this end of town is historically associated with the 1775 march of the Minutemen, the fertile glacial sediments under and around the Playscape have been cultivated for over 4,000 years. Concord’s Great Field, a grazing and agricultural commons stretching from the town's eastern boundary to the center, extended this tradition into the 17th and 18th centuries. Irish and Italian immigrant farmers and their descendants have actively tilled this earth since the mid-19th century. 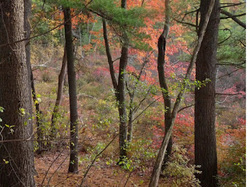 Henry David Thoreau's family homestead is within walking distance of the Playscape. Thoreau was especially fond of the wetland adjacent to the Playscape and patiently documented the natural rhythms and native inhabitants of this robust and unique ecological setting. 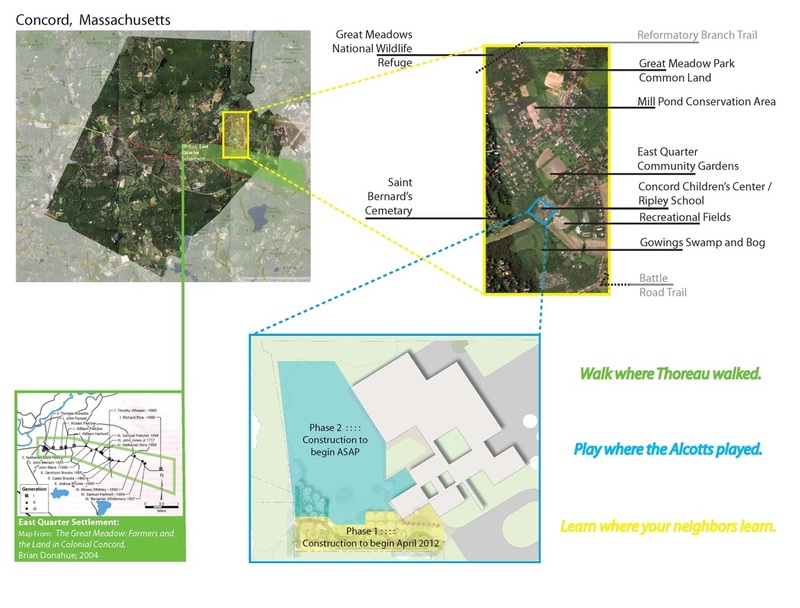 Concord’s East Quarter today buzzes with a diversity of activity, including commercial and CSA farming, a community garden, recreational fields, hiking trails and access to a vast network of conservation lands, and soon a new playscape. The Playscape provides a wonderful opportunity for families and residents to come together and enjoy the outdoors while contributing to the rich textures of life and history so vividly present in the landscape. A historic cart path re-traces the footsteps of the Minutemen. Photo courtesy of Cherrie Corey. 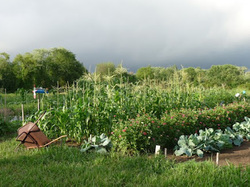 East Quarter Farms community garden contributes to a strong sense of place. Photo courtesy of Cherrie Corey. Natural diversity and beauty are a hallmark of the surrounding landscape. Photo courtesy of Cherrie Corey. Ecological Diversity – So Much, So Near! The Playscape abuts conservation land containing a unique ecological phenomena – a level bog, formed in an ancient kettlehole left by glaciers and filled with rare and unique plant species. It is known to locals as Gowing's Swamp, named after the land owner of long ago. Jointly owned and managed by the Sudbury Valley Trustees, the Meriam Close PRD Trust and the Concord Land Conservation Trust, it is a fragile treasure of horticultural diversity. The Playscape at Ripley hopes to capitalize on opportunity to educate and inform the children that use the Playscape, as well as citizens in the larger community, about the importance of being good stewards of such a rare and historically important place. The Playscape at Ripley is located at 120 Meriam Road in Concord.